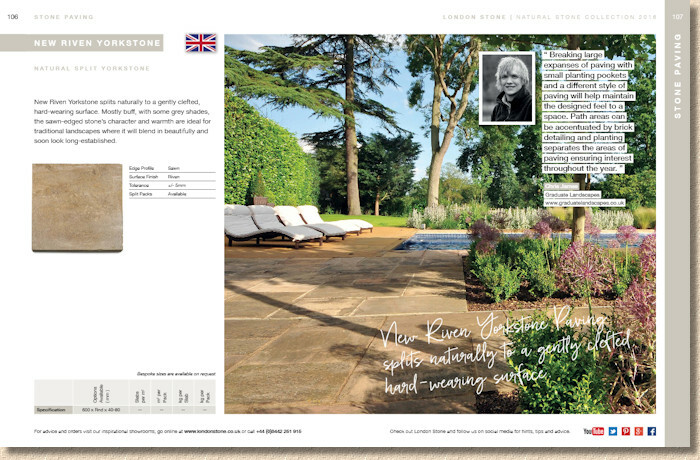 Last year's brochure/coffee-table-tome from London Stone was truly a thing of wonder. 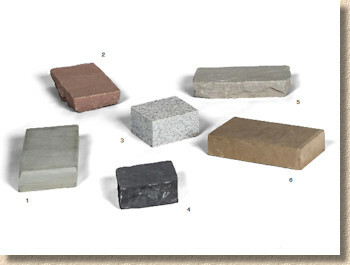 In fact, there were doubts as to whether it could really be considered a brochure or should it be more a reference book for the stone paving trade? First glance at the latest edition for 2016 would suggest that, yet again, the market leader in this sector has gone for impact. It's slightly smaller, in plan size – 200x260mm whereas last year's was 230x280mm – and 272 pages rather than 220. If you're sad enough to do the sums, (and I am!) that's more-or-less the same in terms of square metres of content, albeit the 2016 edition just feels less cumbersome, more comfortable in the hand, but not as generous when opened out. Classy cover of what is, presumably, a flamed black basalt, with the London Strone name and logo embossed onto it, and then a contents page straightaway on page 3, making it easy to find just what you're looking for. What is noticeable, however, is the amount of space given over to comment, opinion and general information. It's page 50 before there's any stone shown and described in any detail. Now, in the past, I've had a bit of a pop at companies that waste page after page blowing their own trumpet, telling anyone daft enough to read their guff just what a wonderful crowd they are and how their products are, somehow, superior to anything else on the market. Maybe I'm just a jaded cynic, but anyone at the sharp end of the trade knows that what the buying customer wants to see is the meat: the products with illustrations of how they are used. They are not really interested in how much carbon has been saved or which big dinner the sales team attended. 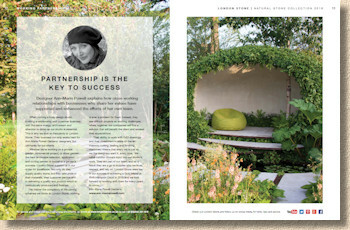 Well-known faces discuss their relationship with London Stone So, fifty or so pages of 'comment', more pages than some suppliers have in their entire brochure, needs some serious justification and, overall, London Stone have pulled it off. The individual pieces are well written and, while not every one of them will have you glued to the page, there is some genuinely interesting and entertaining information to be had. 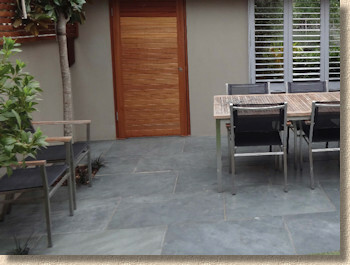 The overall impression is that London Stone have set out to be more than a supplier to the trade, but more of a partner, working with contractors and clients through the whole process, from concept to installation. Enough about the filler, what about that meat?, Well, there's plenty of it, pages 50 to 155 dealing with just the paving, and then there's equally generous coverage for steps, copings, stonemasonry and accessories (sealants and jointing), taking us all the way through to page 236 which starts a closing section of comment and opinion focussing on garden design with some intriguing insights from well-known names. As for that meat, well, this is proper steak, not mince or offal. Page after page after page of what has to be acknowledged as a pretty comprehensive collection of the best stone currently available in Britain. And so well presented! Each alluring option is afforded a double page spread, with a succinct description tending the factual rather than the flowery, a reasonably sized swatch, tabulated info on edge details, surface finish, tolerances and availability, and a separate matrix with size options and packaging arrangements. 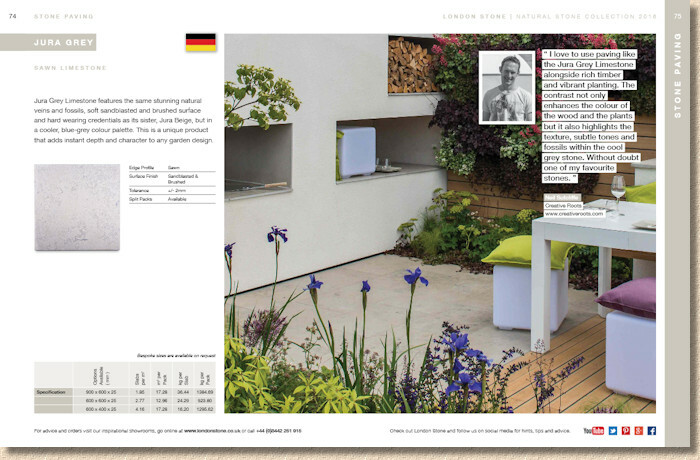 All this is complemented with a feature photie spread over a full page and a bit, with supportive quotes from various designers and installers. It gives the whole section more of a magazine feel, tying in with the comment and opinion pieces to reinforce that relaxed, coffee table, browsability feel. 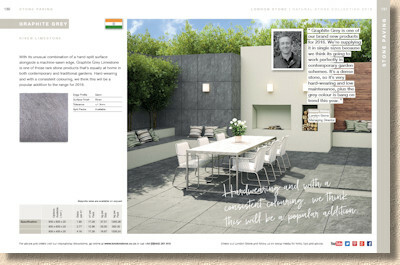 It doesn't have the strict formality of a regular paving brochure, the sense that you're reading a menu. 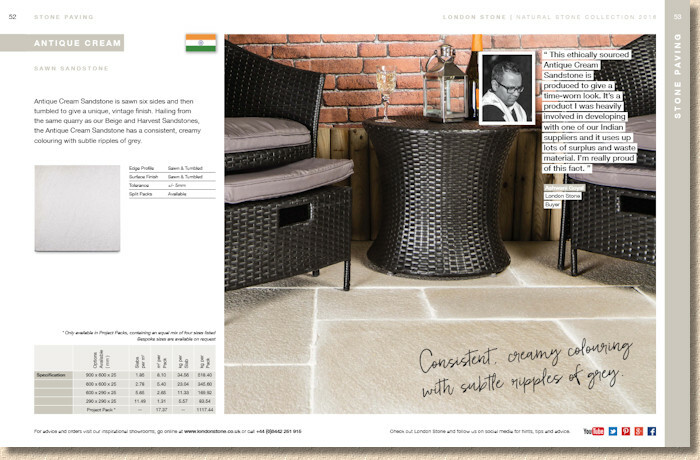 With the London Stone brochure, it's more akin to skimming through a high-end monthly and being repeatedly pulled in by the charm of it all. However, all this informality can have a cost. Some of the images are more arty than illustrative; some of the overlay headshots and Dymotape quotes detract from the image, or take up too much real estate. It's a near impossible balance to achieve: chatty informality but using photies that give a good and fair impression of the paving. There are one or two (well, three or four, probably) shots where the paving seems like an afterthought to the setting, the decoration, the furnishings and the flowers. Are we buying a paving or a lifestyle? Still, the quality of the photography is exemplary. These aren't cheaply staged snaps or site piccies taken on a cameraphone, oh no! These are professionally composed and captured quality images. Look at the clever lighting, how the shadows are diffuse and never obscure the stone. Notice how there's a balance, how each has a natural focal point. Double-check those swatches and standalone support pictures from crispness and clarity. Someone has put a lt of thought and quality management into assembling this. Considering the breadth of products offered, it's easy to overlook something that's new. Most suppliers/manufacturers make much of the newbies for each year, but in here, they are almost sneaked out, given a place of their own with little or no introduction, other than a somewhat disconnected 'Product Innovation' page (p26-27) which doesn't really make clear whether these are new products or examples of range extension. We like new products. It doesn't matter too much whether they are dead-cert sellers or just an interesting by-line, the real purpose of new products is to impress the message that the brand and the range is evolving, that there's no resting on laurels, that the business is constantly updating itself. So, why not make sure those new products get noticed? A little 'flash' on the contents page, a star or stamp on the page itself proclaiming the new arrival, some means of emphasising that all-important brand development, and it can't hurt if it helps sell to those customers who always want the latest, no matter what it might be. As with last year's edition, it's petty to pick minor faults with what is, without doubt, the best brochure devoted exclusively to stone (and porcelain, don't forget to mention the porcelain!) paving. Still, as the market leader in this sector serving the more discerning customer, the choosy contractor, and the quality-over-cut-price commercial projects, we rightly expect ever more glorious results. 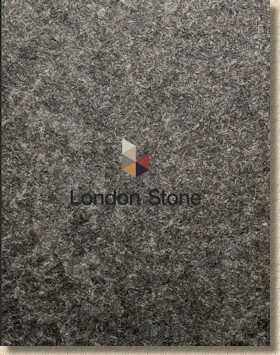 London Stone set the bar themselves, and by setting it so high, they've committed themselves to doing bigger and better with each year. 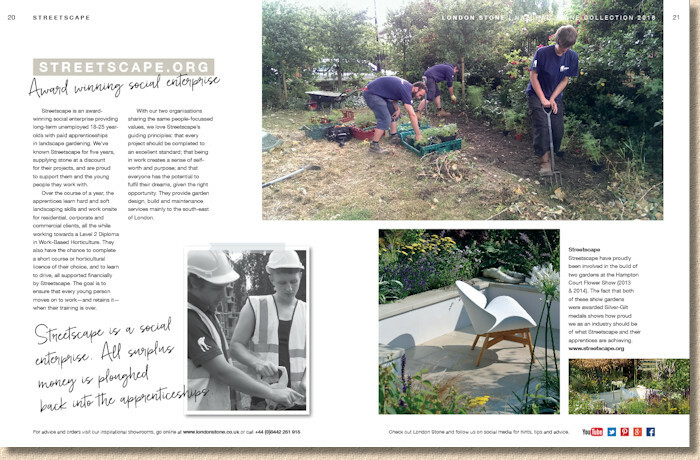 For 2016, they've outdone themselves and produced a brochure/book that is not only a superbly useful guide to their product range but is also a genuinely entertaining and educative read for anyone interested in stone and hard-landscaping.